TWELVE NORTH FLORIDA SPRINGS—AND THE AQUIFER THAT FEEDS THEM—FORM THE NUCLEUS OF THIS BOOK THROUGH THE ART AND WRITING OF ARTIST MARGARET ROSS TOLBERT. But the aesthetics and science of this book speak to all of the freshwater springs in Florida—as well as to those readers who would experience, explore, and acknowledge the sublime qualities of these unique natural systems. AQUIFERious also includes photographs, artistic cave maps, essays and scientific articles from ten contributors that recount a world of extreme cave diving, history, literature and science. The poetic—with the passion for the fragile springs and the creativity they inspire—is tempered with sobering stories of loss of flow and water quality. Useful links, information and how-to advice for helping conserve and protect the springs are included. A percentage of sales goes to groups helping the springs. Printed by Fidelity Press in Orlando, 176 pages casebound, 9 x 12 inches, designed by Jarrod Ryhal. Available for purchase from Thornebrook Gallery in Gainesville, FL, The Harn Museum Store in Gainesville, FL, Ginnie Springs Outdoors in High Springs, FL, or at Amazon.com. Visit margaretrosstolbert.com for more information about her work. AQUIFERious includes detailed chronicles of the seldom-seen life forms inhabiting the depths of the springs, as well as accounts of increasing pollution that threatens both the quality and magnitude of the spring outflows. Contributions include Bill Belleville's (billbelleville.com) literary history of springs in Florida Springs: Eocene memories, Fueled by a Dream, Stefan Craciun's essay and images about Sirena, and biologist Tom Morris' Life in Florida's Aquifer Caves, which include his underwater images of the enormous caverns under Silver Springs and Silver Glen springs, as well macro photos of rare cave crayfish and shrimp. Other gripping and graphic perspectives are provided by Eric Hutcheson (erichutcheson.com) via his accounts of his exploits as an extreme cartographer in The Amazing Maps of Eric Hutcheson, Howard Jelks' informative Springs: A Florida Treasure, Denise Trunk Krigbaum's account of Springs Critters, Jon Martin's informative article on Springs Water Ages, Dan Rountree's essay on Siphons and Swallets, Georgia Shemitz's map of springsheds and recharge areas, and Jim Stevenson's urgent plea, Florida Springs: a Cloudy but Hopeful Future. Dina Liebowitz reveals the monumental contribution of miniscule snails in cleaning up the springs. Matt Cohen describes the " heartbeat of the river" and the ability it has to cleanse itself; and Bob Knight paints a poignant picture of the decline of Silver Springs and the history of the studies of the springs. FOLLOW THE LINKS BELOW TO THE LATEST REVIEWS AND INTERVIEWS ABOUT MARGARET'S WORK. "Margaret Tolbert's experience of Florida's springs changed dramatically the day she donned a mask and plunked her face below the water's lens-like surface. She says she felt like Alice, crossing through the looking glass into an alter world, where nothing was as it seemed. Up until then, springs were something Tolbert was aware of—they were often in the background at family picnics when she was growing up—but she'd never experienced them." Florida springs painter finds conversation "inescapable"—an article from Wild Muse. The new edition of "Alachua County Talks" , which premiered on Friday, April 29, 2011 at 7:30 pm on Cox channel 12, features an in-depth interview with renowned artist Margaret Ross Tolbert. Tolbert discusses her new book "Aquiferious," which took a Florida Book Awards gold medal in the non-fiction category and silver medal in the fine arts category. The Howard T. Odum Florida Springs Institute is a program of Florida's Eden, a 501(c)3 non-profit organization dedicated to uniting 30 counties in north Florida for the purpose of protecting natural resources and using environmental and creative assets to build a sustainable and prosperous economy. Jon Wilson's FORUM Magazine article article describes Tolbert, Aquiferious, the contributors and the magic of the springs. Jack Davis' op-ed piece, "Florida's beauty at risk", underscores the urgency for protection of the springs. "There are brushstrokes of indigo, swaths of blue and green that flow from separate beginnings into swirling wholes to spur a thirst for more: more knowledge, more information, more representation." Continue reading more from the article, "Paintings illuminate Florida's springs". "From tiny trickles known only to deep backwoods explorers to mammoth gushers like Wakulla, Manatee and Silver Springs, Florida's 700 natural fountains rank among the world's greatest wonders." 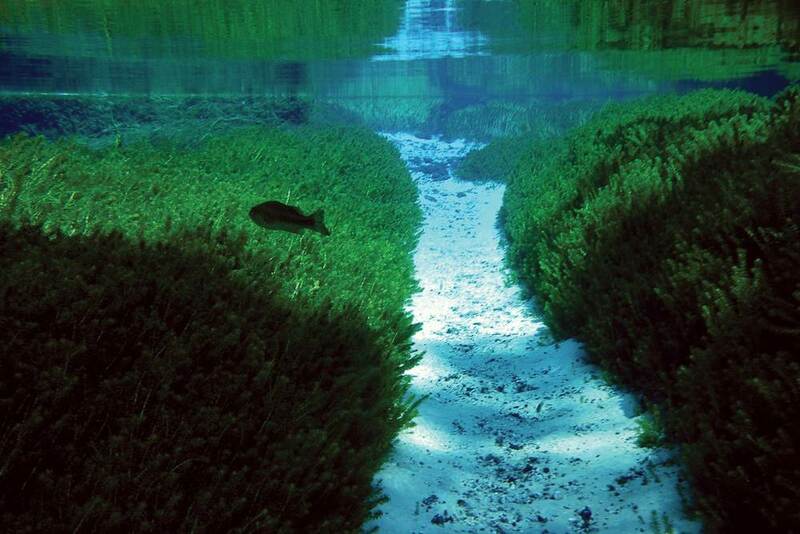 Continue reading more from the article, "Florida's Natural Springs, the Real Fountains of Youth".